Just when I think I'm getting somewhere ticking places off my Singapore Bucket List another "must visit" place is added... then another...and another.... 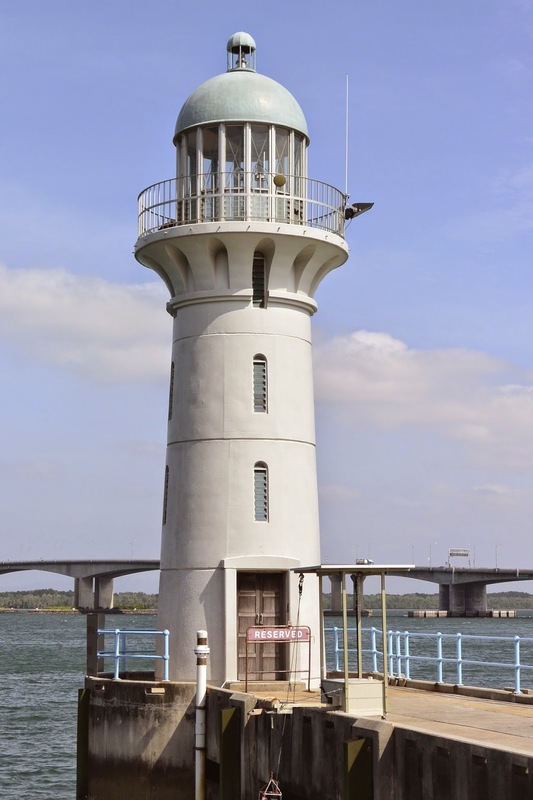 Anyhow recently added to this never decreasing scroll was the lighthouse to the West of Singers, giving safe passage to boats entering the Johor Straits from its western entrance. 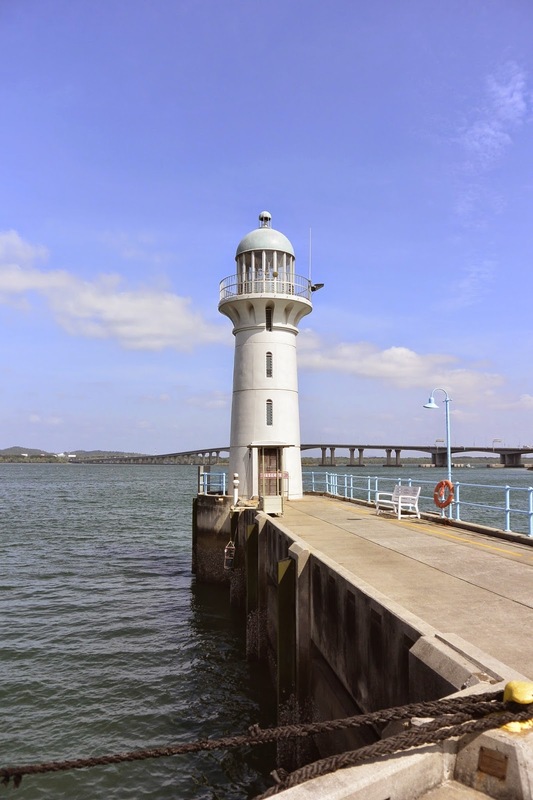 Sitting at the end of the pier overlooking Raffles Marina is the aptly named Raffles Marina Lighthouse or Johor Straits Lighthouse. 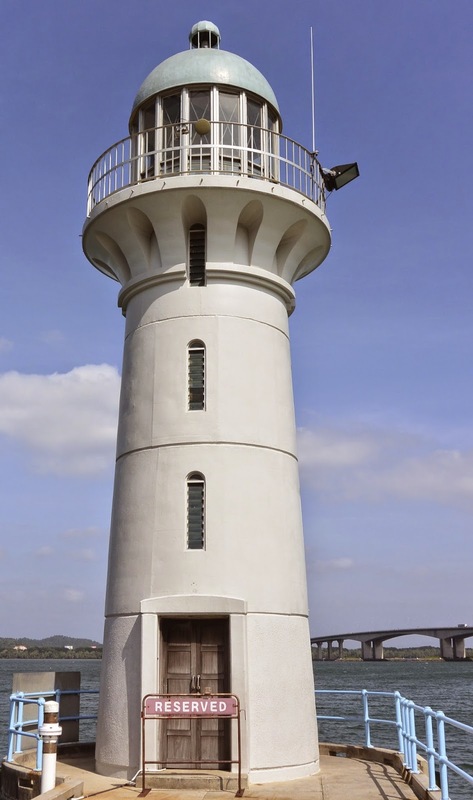 Not to be confused with Raffles Lighthouse, which is on Pulau Satumu (Coney Island) The lighthouse is about as far West as one can go in Singapore without needing your passport. It sits under the shadow of the causeway bridge at Tuas, which crosses over to Johor Bahru in Malaysia. There seems little information surrounding this building except that it is still in use and managed by Raffles Marina, unlike the other lighthouse here which come under the Maritime Port Authority (MPA) It sits looking seawards at the straits towards Malaysia and inwards towards the mega million dollars yachts and boats you will see moored in the Marina, no wonder they want safe passage into their berths. It's stands 12 metres high and flashes every 10 seconds with a beam that reaches 15 metres. There seems no information on when it was built although by deduction it was after 1850 when the first one was built. We did ask permission at the Marina to enter and walk along the jetty to take photos and were given permission on the understanding we only shot out to sea and only took the lighthouse and no boats. Since returning I have found out that the Marina and pier is open to the public but I still feel on a quiet week day asking permission was the right thing to do. However feel free to visit, there are two restaurants there that seemed to serve reasonably priced meals. Not a bad place to spend a few hours, with a glass of vino overlooking the straits, enjoying the sea breeze and dreaming that one of those yachts, bobbing rhythmically in the water is yours - we can dream! 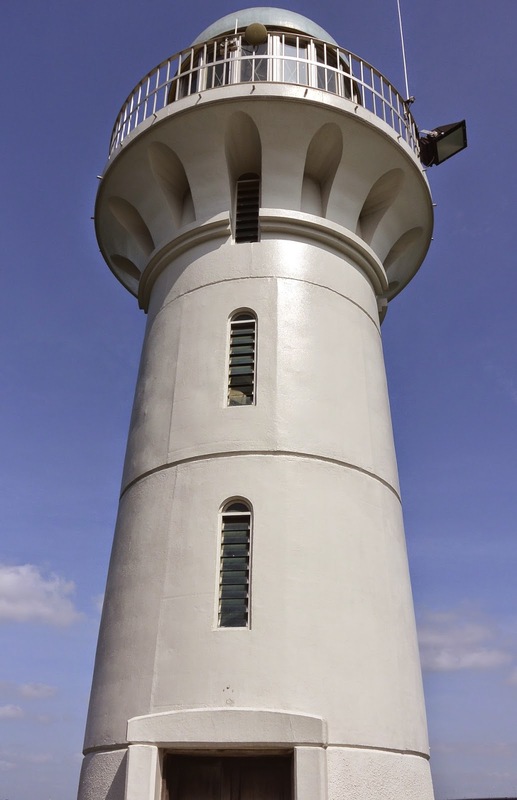 There are a few more lighthouses in Singapore that are still in use. 1. 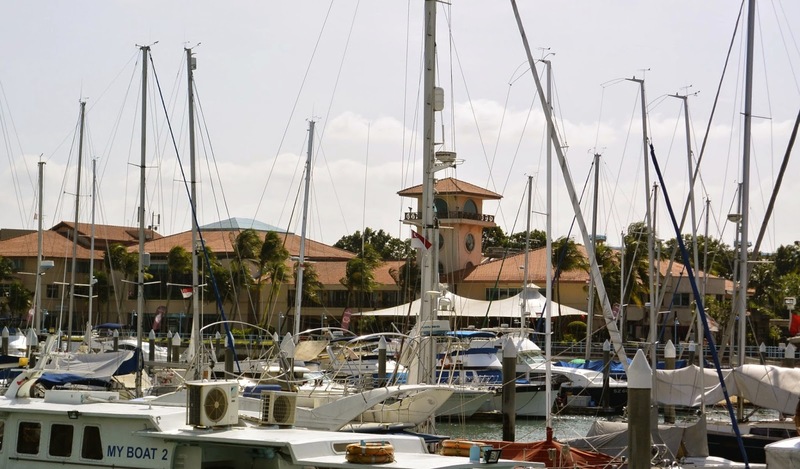 Horsburgh which sits on Pedra Branca in the East of Singapore. 2. Raffles which as mentioned is on Pulau Satumu (Coney Island) North East Singapore. 3. Sultan Shoal on a small south west island. 4. Bedok. Not in fact in Bedok but on top of Lagoon View condo, Marine Parade on the East Coast, a short walk from where we live. 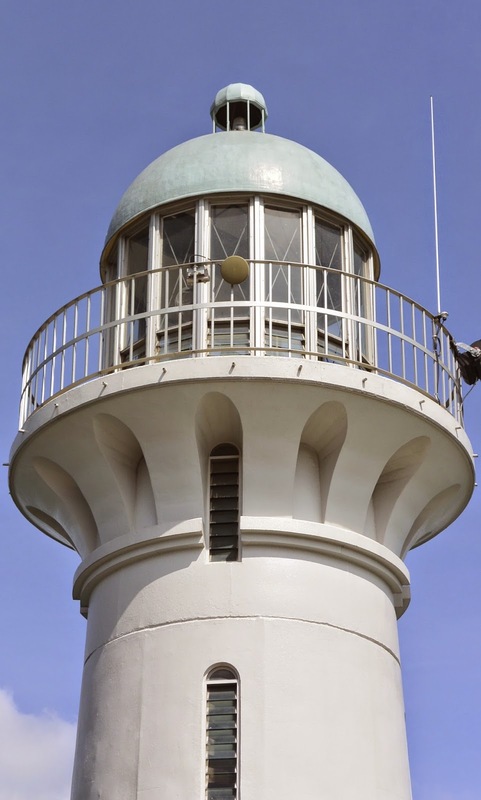 This was actually built in 1977 to replace the lighthouse that once was on top of the Fullerton Hotel. 5. Pulau Pisang which is in Malaysian waters in the Straits of Malacca.